RURAL 37+ ACRES PRICE REDUCED KINGMAN AZ! Lot 4B Knight Creek Rd. This Silver Springs parcel is about 2 miles south of the I-40 in between Hackberry and Silver Springs Rd. Nice parcel bordering public land to the north and west has a road cut through it. 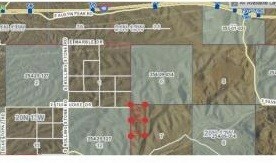 The adjoining parcel, just north is about 40 acres (pcl 254-14-004A) also for sale. Rural 37+ Acres PRICE REDUCED Kingman AZ! Both parcels can be purchased for $50,000.00. Silver Springs is an area about 30 miles east of Kingman off of Interstate 40. The elevation is higher at between 4000 to 5000 feet. The area has pinion and junipers and is cooler than Kingman and a lot cooler than the deserts of Phoenix and the city of Las Vegas (about 2 1/2 hours away). Rural 37+ Acres PRICE REDUCED Kingman AZ!